“This article is not aimed at defining trauma, but rather at generating further questioning, in the interest of deepening our thinking and feeling as front-line carers and activists” writes psychologist Johanna Kistner in the second issue of AIR Thoughts. Drawing on decades of experience in providing and designing mental health services in marginalized communities in South Africa, Johanna calls into question the heavily individualized and de-politiczed models and language that are used to deal with people’s emotional and psychological distress. Sharing reflections from her clinical practice and analysis of colleagues and clients, she calls for a re-politicizing of approaches to trauma work in African contexts. 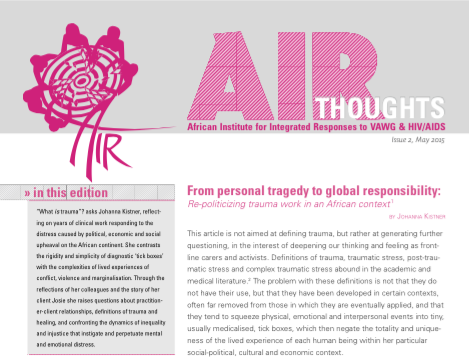 Read From personal tragedy to global responsability: Re-politicizing trauma work in an African context ( AIR Thoughts Issue 2 here ).